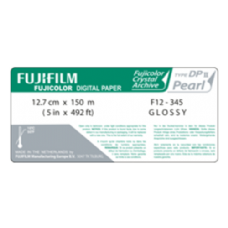 Fujicolor Crystal Archive PEARL is a silver halide colour paper with a unique pearl-like, silvery iridescent appearance, heavy base and high stiffness. The embedded pearl-like crystals give a high gloss effect reflectance, especially in the highlights. This "pearl" effect is visible as a result of the crystals in the surface scattering and interfering with light as it hits the surface. When used on medium or large-scale digital printer systems (such as Chromira, LightJet, Noritsu, Frontier etc.) this paper yields high-image gloss top end prints making it ideal for such professional uses as high quality portrait, wedding, fashion or commercial photography. It has the highest level of image stability, making it is ideal for display purposes. May also be exposed optically in older machines or in the darkroom. The Fuji alternative to Kodak's Metallic paper.